According to ancient Chinese customs – and especially in Classical Feng Shui – left and right are regarded as Green Dragon and White Tiger. In Feng Shui, they represent the landforms to the left and to the right of a building when looking outwards (with your back to the building). 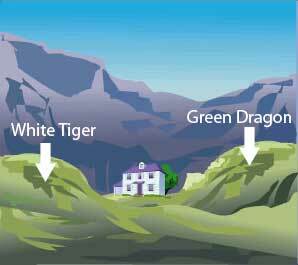 The Green Dragon also stands for the male principle, while the White Tiger represents the female aspect. Harmonious landforms around a building must always include a Green Dragon and a White Tiger embracing the building itself. 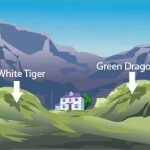 If the Green Dragon is missing, the female occupants will be dominant – and the lack of a White Tiger to the left of the house signifies a weak female component. Of course it would be best if this embrace is formed by natural landforms, such as mountains or mountain ranges. However, in an urban environment, this is rarely possible, and we have to make do with the neighboring buildings. Without this embrace, support, health and wealth luck of a building will be lacking, and the occupants will feel unstable and won’t prosper. So, when moving to a new place, don’t just look at your own building, but also at what surrounds your building and what structures support it!